Depending on what type occasion you are planning to use your sparklers for, sometimes you will want them to be very long so they can burn for an extended period of time. 36 inch sparklers are the premier choice if you are looking for sparklers that will burn for a long time and also produce very large and impressive effects. There are a number of different reasons that someone might want sparklers that burn longer depending on their use, and we will cover some of those reasons below. The 4th of July is by far the most popular time for people to light sparklers, and wanting them to burn for a long time is also very common. It can get very annoying to light several sparklers for the kids who are with you, so having them burn for a while can be a great benefit. With 36 inch sparklers, you can light one for each kid and it will burn for the vast majority of the big fireworks show you’re probably watching at the end of the evening. New Year’s Eve is another time that sparklers are very popular. When the clock strikes midnight, many people light up really long sparklers to give the previous year a proper farewell and celebrate what has yet to come. By using 36 inch sparklers for your celebration, the sparkling fun will last all through your big kiss and straight through the group singing. Sparklers are also a great way to celebrate Veteran’s Day as the parade comes passing by with all the heroes that we honors and treasure on this special holiday. The best part of using longer sparklers for a Veteran’s Day parade is that they will last through the whole parade without needing to stop and relight a new one. The people in the parade will simply adore the glittering and sparkling spectacle as they make their way down the parade route and you can really convey your gratitude for their years of service to making sure that our country remains free. Weddings are one of the events types that are just beginning to emerge from within the sparkler industry. Many couples choose to use sparklers as part of their wedding exit while others simply choose to hand them out to their guests so they can have a little more fun. By far the most popular size sparkler to be used at weddings is the 36 inch sparkler because of how long it burns and how long it is physically. 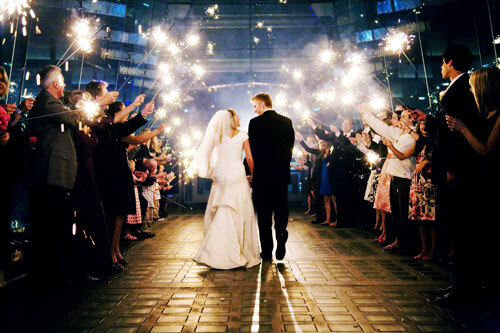 Many people like to walk underneath the sparklers during their exit, so the length of the 36 inch sparklers ensures that the happy couple doesn’t get injured just minutes after they tie the knot.